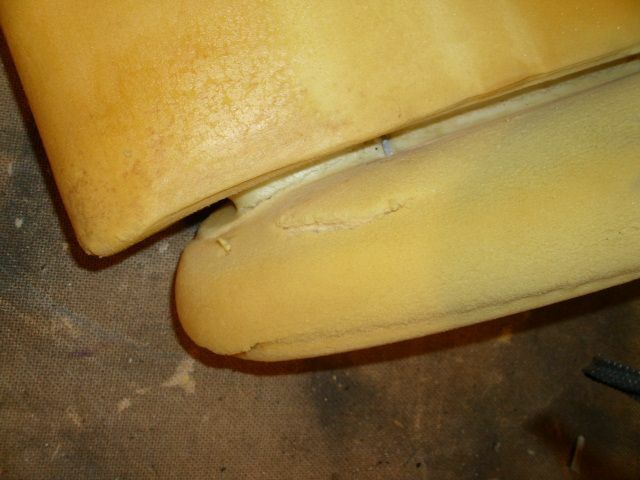 Repair your Seat bottom bolster foam. 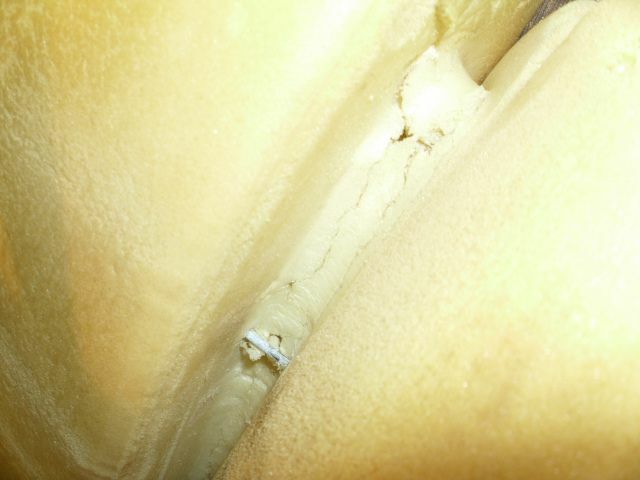 My Seat Bolster Foam is Broken and I can feel the Bar poking the material. 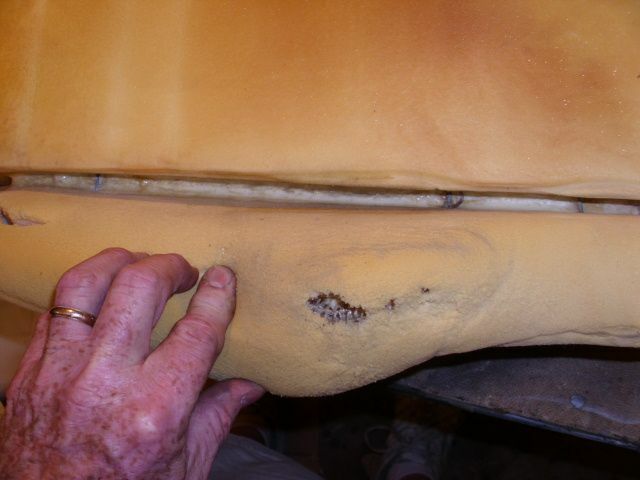 If your seat bottom bolster is cut through as many of ours has, but you can feel the Bar but the material is still intact. Then you need to do a little work. 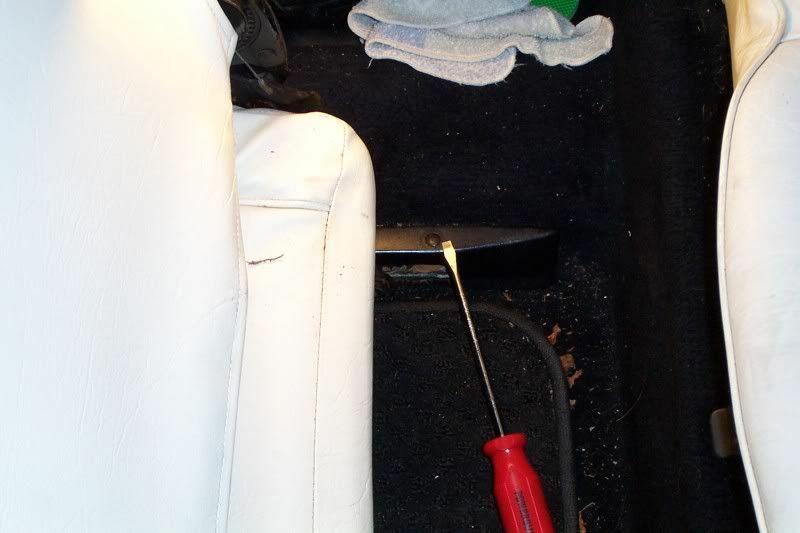 Take the Seat out of the car, that is undo the rear seat rail and remove it by popping the clip and slid it to the rear to remove. Scoot the seat forward and remove the Acorn nut. 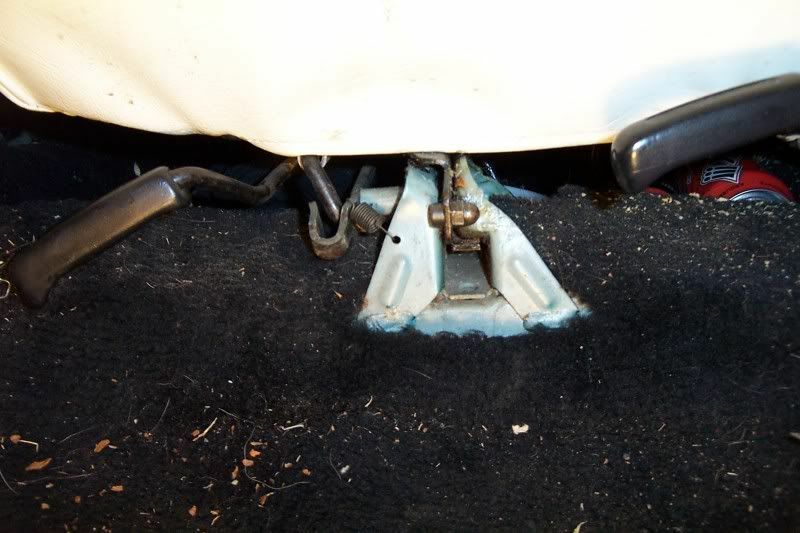 Now push the seat out and remove it from the car. Place it on a table or bench. 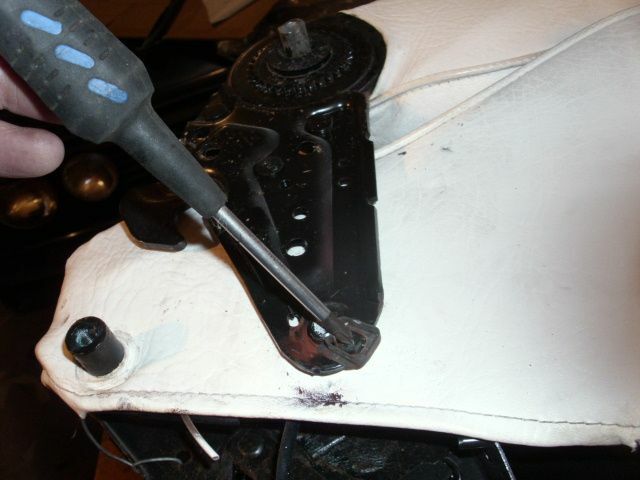 Remove the Side covers by pushing the pins (3) out then angle it up as it is hooked at the top edge. 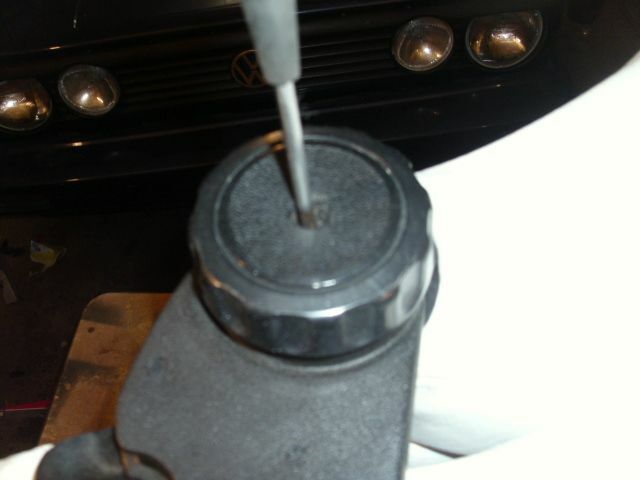 Remove the Seat Adjust knob by unscrewing the phillips screw. 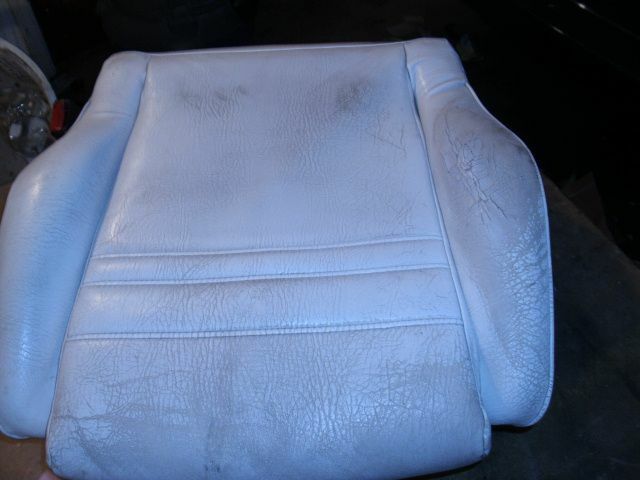 Remove the 2 plastic caps that the seat back catches on. Now remove that side cover. 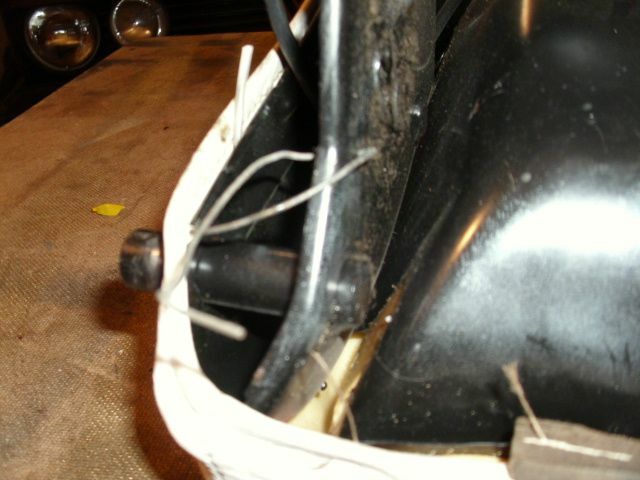 Remove the 2 clips that hold the Seat back to the Seat bottom one each side. 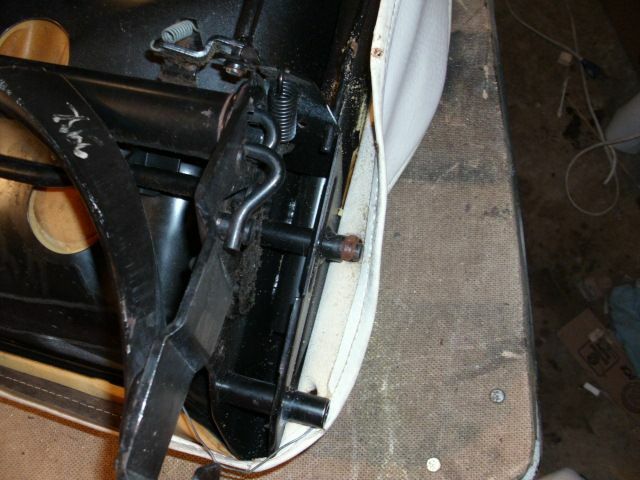 Fold the seat, and pry the side frames off the seat bottom pivot. Separate the back from the bottom. Pry the 2 pins out at the front. 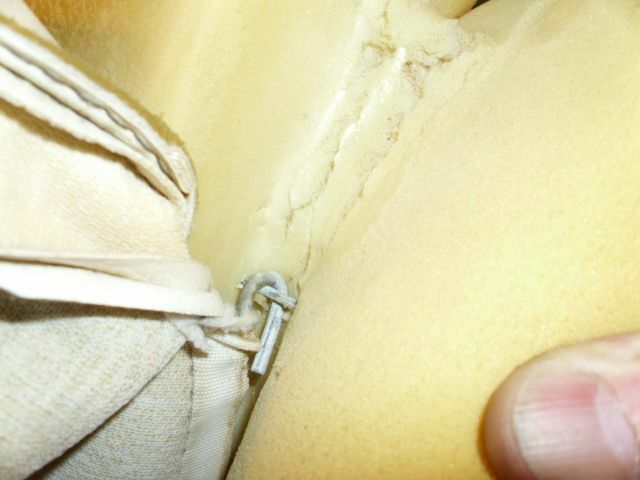 Pull the Cardboard retainer out of the slot in the back. Remove the 2 wires that are holding the sides on. 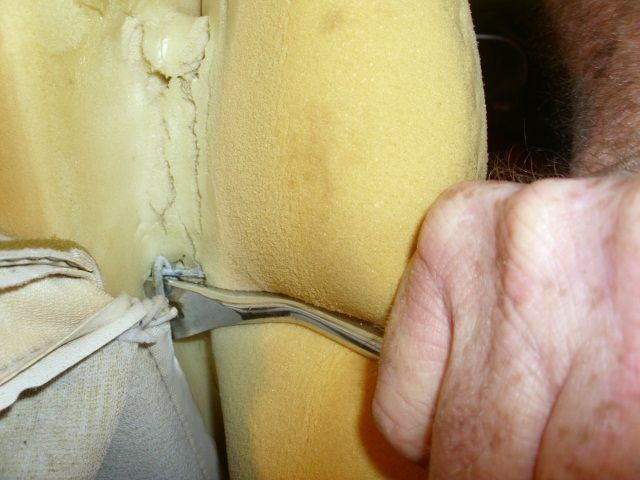 Careful bend the 2 finger hooks up and pull the Material off the finger. 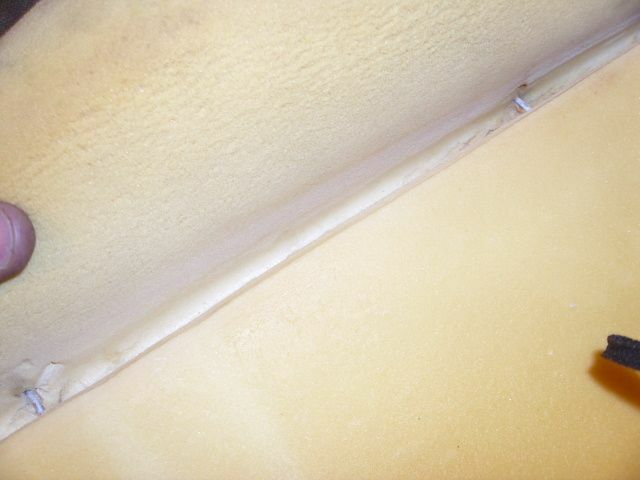 Slowly pull the material off the frame (it is still attached to the foam you have to separate the foam from the frame…. 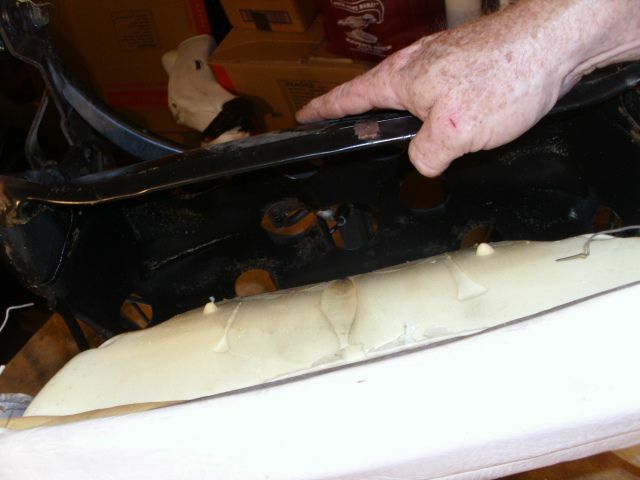 but take the seat cover off the frame and remove the cover and foam together. 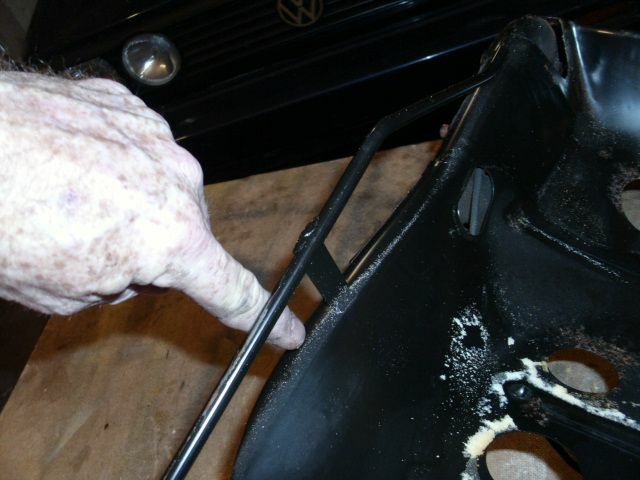 If your foam is stuck, then be careful and assist it with your fingers off the seat bottom. 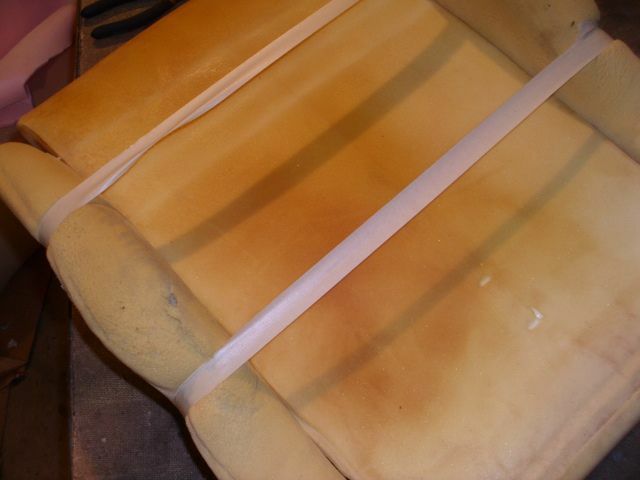 if your seat bottom is rusty the foam sort of glues itself to it. 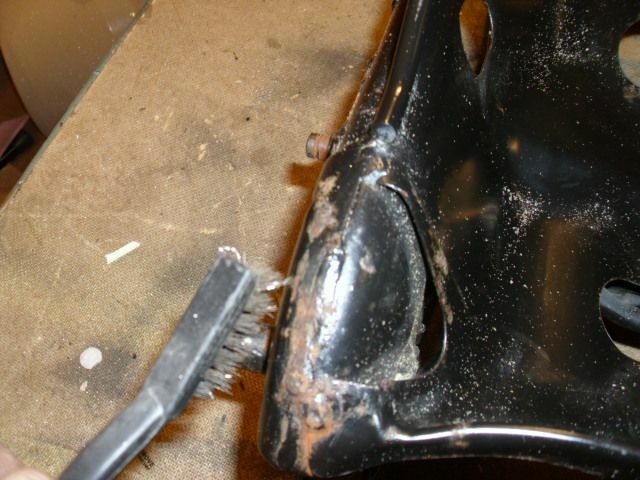 See the Rusty Bottom and the white foam dust…..
Take the time to Wire Brush and prime the rusty areas, then use a rust convert primer and paint. 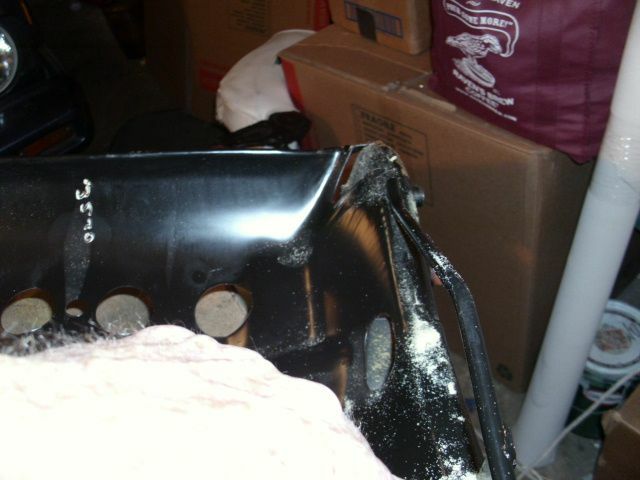 See the Foam Side Bolsters have Split from the main piece. You can even see the Nylon webbing. 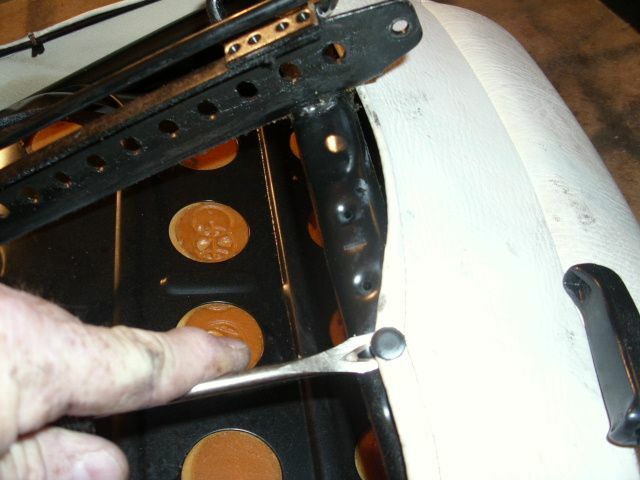 If you Carefully peal the sides you will see a metal bar on both ends of the bolster cut. You have to Pry that steel a bit to get it to open. Clamp a pair of small Vice-Grips on the wire. Stand the foam on end, while compressing the foam Pull the Bar up and off the Catch. Pull the side over more and you will see 1 or 2 hog Rings that have to be cut. 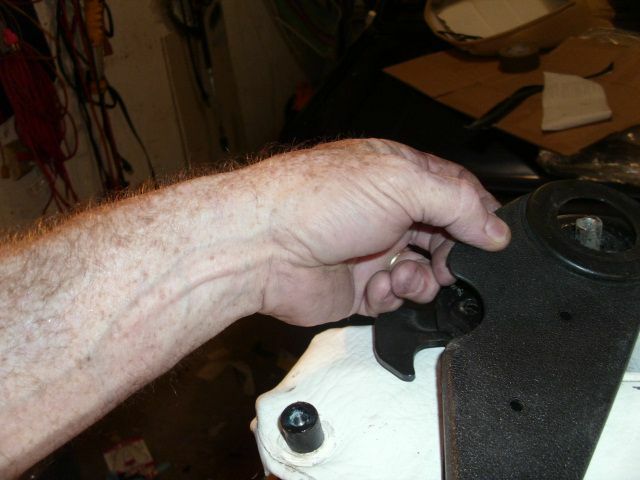 With the hog rings cut you can push the bar off the rear catch. 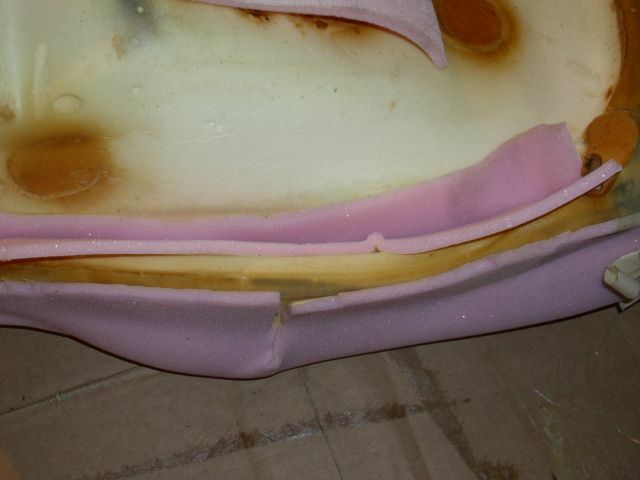 Take care as the material isn’t as supple as it once was it rips easily. 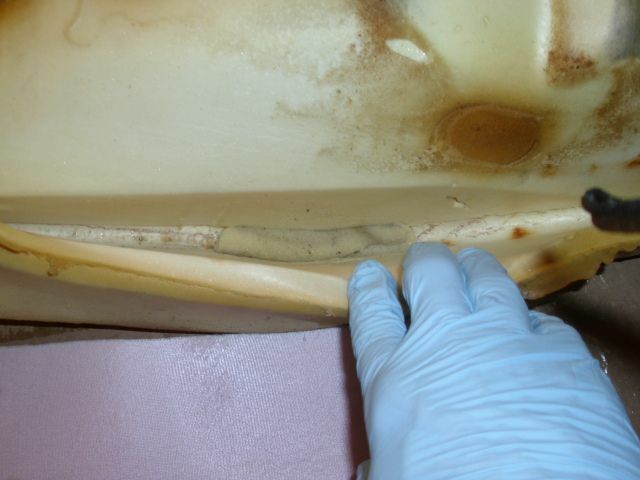 Do the other side the same and remove the cover off the foam. 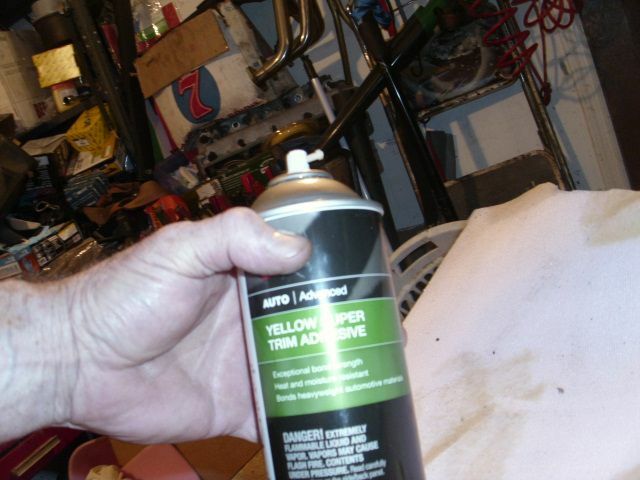 Where the Bolster is breaking away from the main seat, apply water in to the grove, spray or wipe it. Take Gorilla Glue and force it in to the Crack, Do both sides. 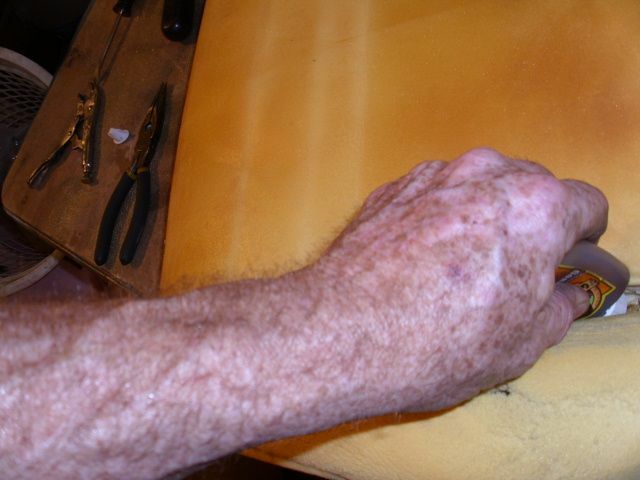 Once the glue is in the Crack, Use tape to hold tension on the repair for at least an hour and a half. 1.5 hours later cut the tape and start the other repair. Open it up a bit and blow the dust and dirt out. Using a cutter, I love the roller cutter. 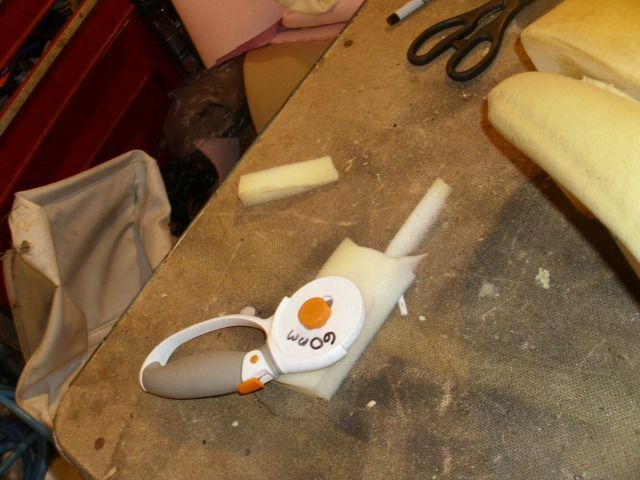 Trim some foam material to the same size as the hot and fit it, trim it with scissors It don’t have to be perfect. Test fit and stuff further or trim it to be the same plane. Get a good contact cement. 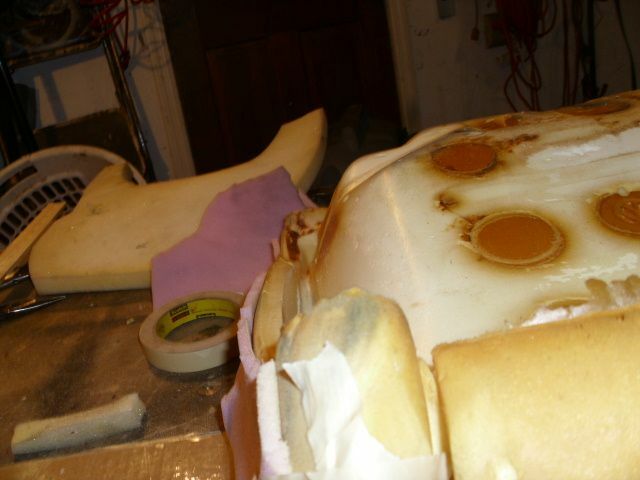 Spray the Patch foam and the Seat bolster. Wait 4 to 5 minutes. 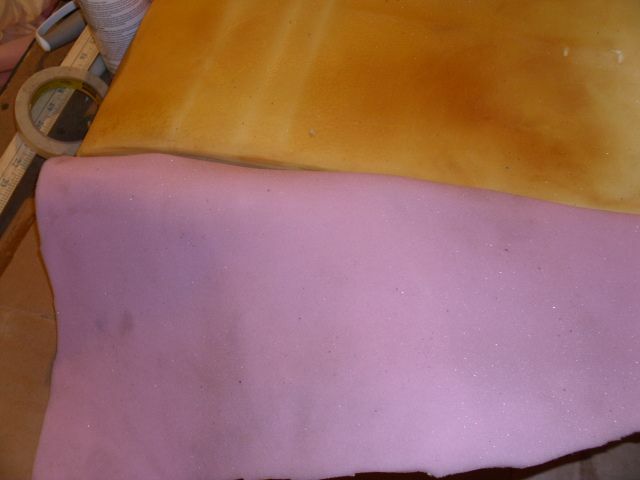 Take a sheet of 1/4 foam, cut it to fit the side bolster from the bottom of the slot around and about 1/4 to 1/2 inch over the edge. 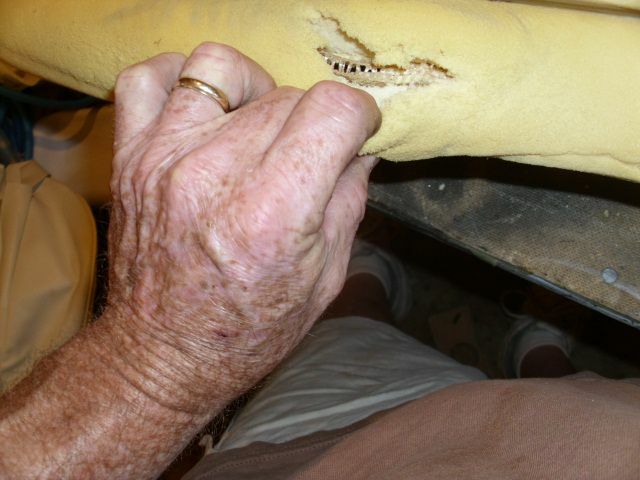 Leave it long for the front so it can pull over and get to the bottom edge of the top of the front of the bolster. 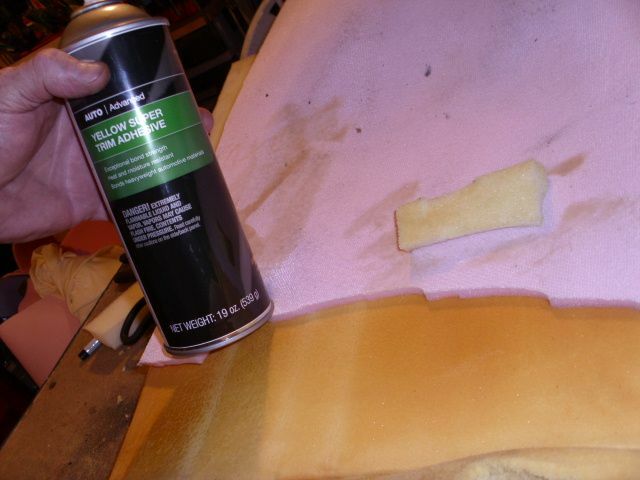 Spray Glue all over the cloth side of the Foam. 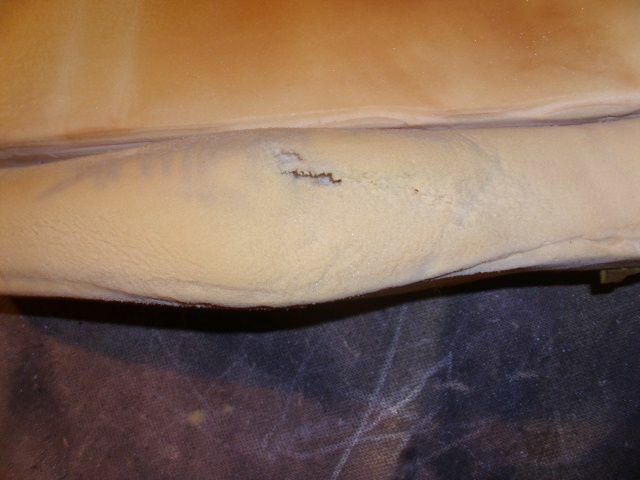 About from the slot to 1 half of the top of the bolster. Insert the foam in to the Slot and carefully pull it over the top. Work it smooth and flat. over the bolster smooth and flat as you can You may have to trim it a bit. 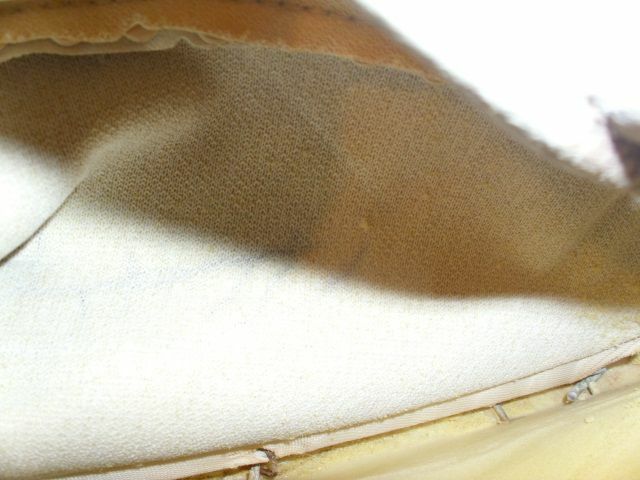 For the front point of the Bolster you are going to cut the foam leaving it long at the point and then wrap the slot side to the outside and the out side to the slot side, cut the foam so it mates but doesn’t over lap at the sides kinda like Wrapping a present. 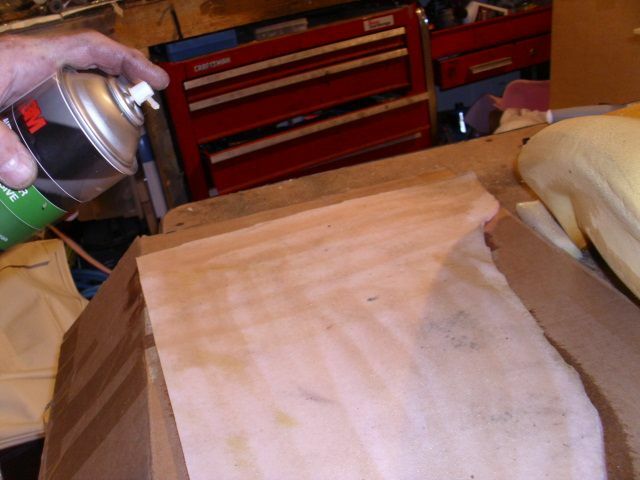 Spray glue on the two Joined pieces, wait a few minutes, then pull the long top piece over the meet. 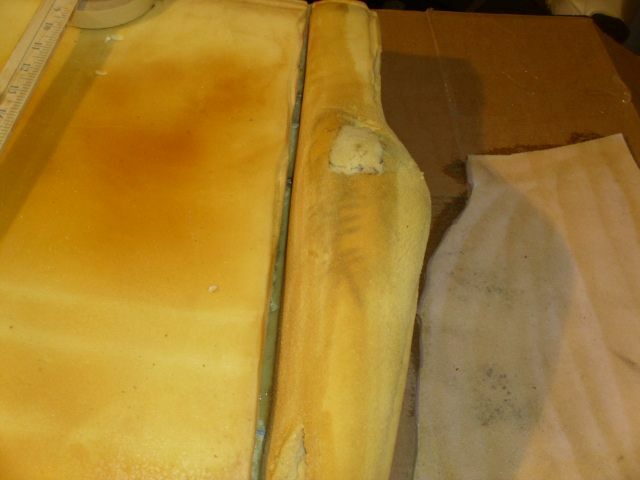 Flip the seat foam over. Take a piece of foam about 6 inches wide and the length of the side bolster frame slot. 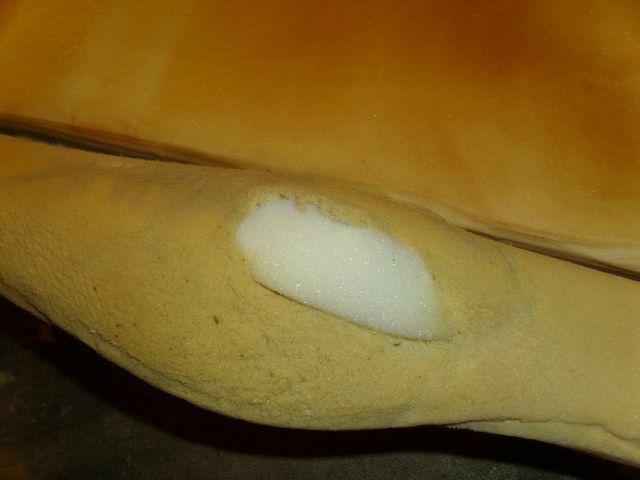 Spray the foam and the inside of the bolster with glue. 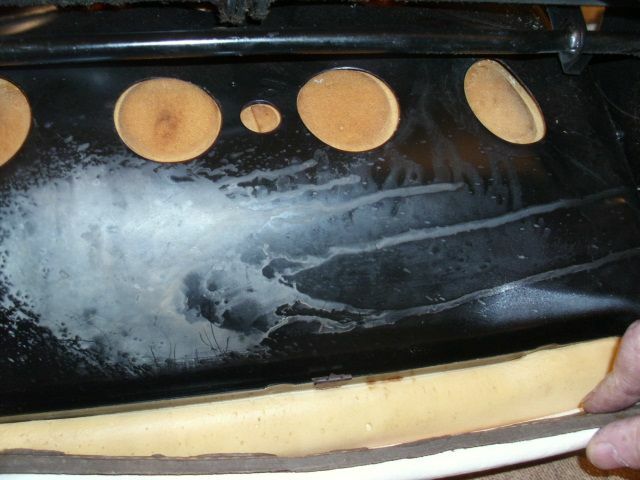 Fold the foam in half lengthwise and insert it in to the slot evenly work it to the bottom, and smooth it on the sides. Gloves are good here. Repeat for the other bolster. 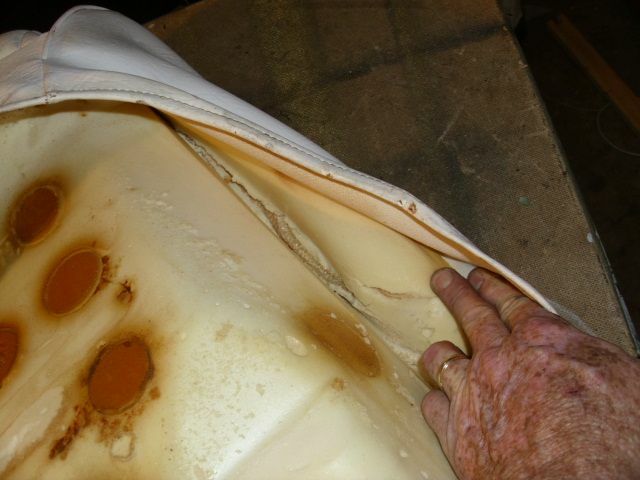 Trim all your foam so it doesn’t exceed the original length. Replace your cover. Hook the Rails at the back, then the front. 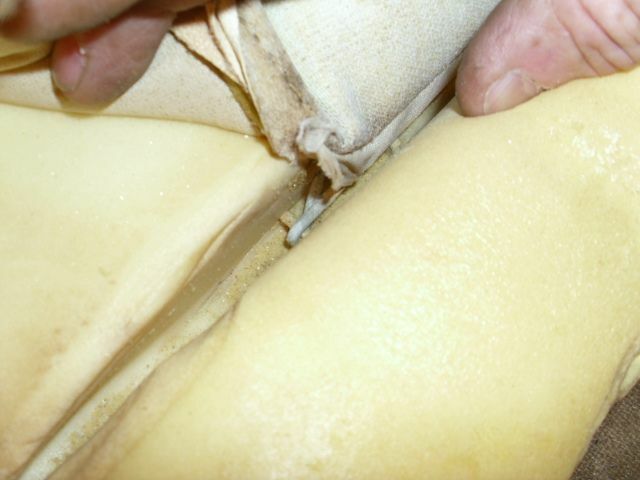 You can use hog rings to reconnect the middle or good wire ties can work just be sure that the cut end is at the foam. 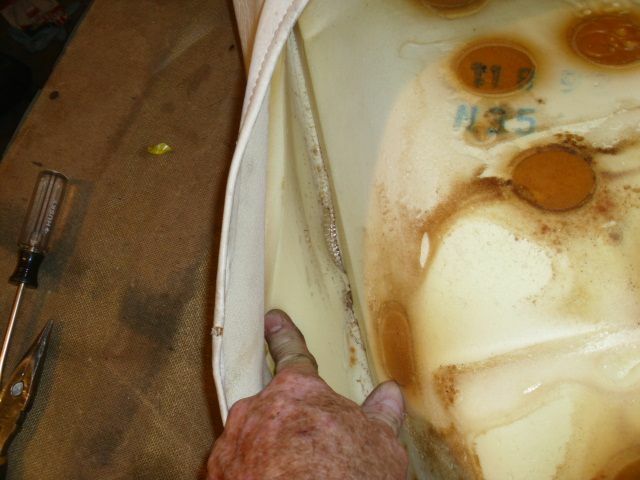 Insert the foam/cover in the bucket. 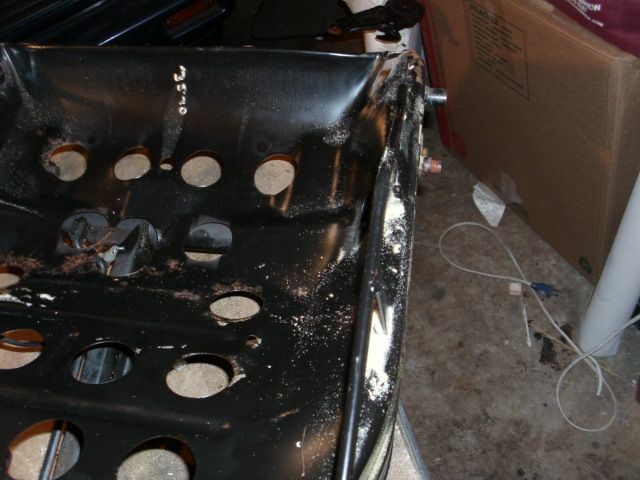 Replace it on the front and rear insert the cardboard and tap it in with a hammer to seat it. 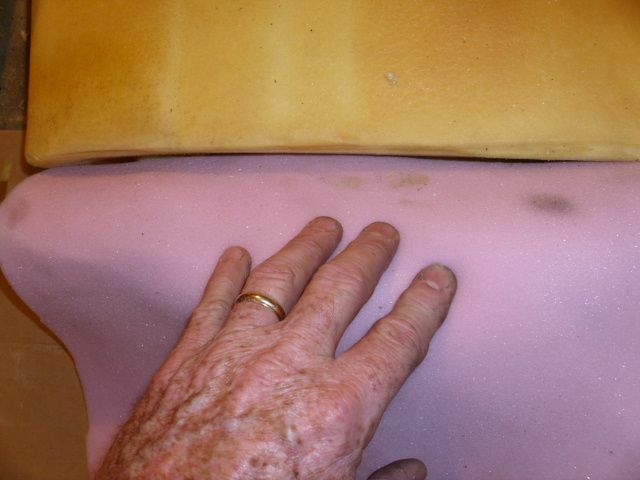 When you are done you now have a repaired bolster foam.